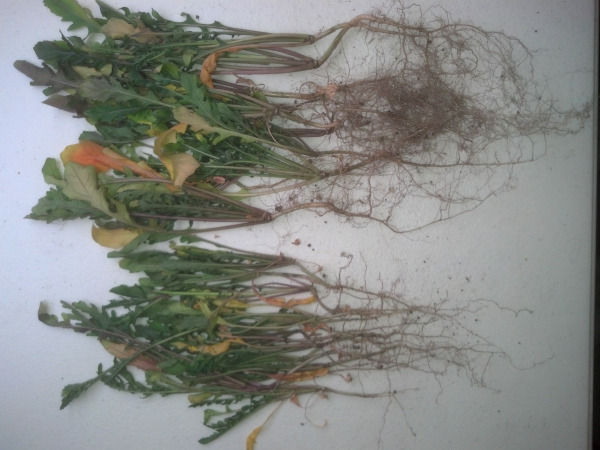 We recently did a test growing Arugula using soil with Aeromaster humus added vs. regular soil. Check out the results. Plants were started from Arugula seed so that we could demonstrate the growth effect of Aeromaster Humus. Soil was taken from the field. Some vermiculite and perlite were added to this soil to help with porosity. The control had no humus added, while the other had 20% humus mixed into the soil. In an attempt to get the first rootlets colonized by the humus microbes, the seeds were also covered with humus 1/8" in depth. The intent was to keep all inputs equal. No fertilizer was used in either group, so the only difference was "no humus" vs "with humus". Not only did the humus cause the seeds to emerge quicker, "the plants" both above ground and below ground showed much greater growth than the control. 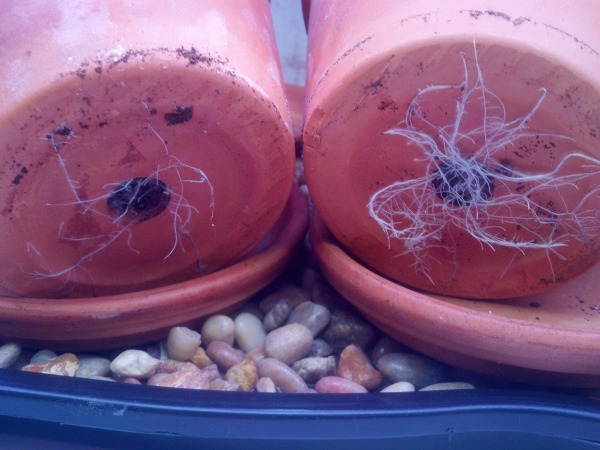 At about 5 weeks, I noticed a very significant difference in the roots that grew out of the bottom hole in the clay pots. With humus, the root diameter and mass appeared to be 3-4 times greater than the control with no humus. Then at about 9 weeks, The plants were dug up and the dirt separated from the roots by hand. From each pot, the five biggest plants were chosen and weighed to compare the difference. Control- plants grown w/o humus weighed 4.2 grams. Plants grown with Aeromaster Humus weighed 12 grams. This calculates out to a 286% increase in weight where the Aeromaster Humus was applied! Contact us to see how you can get these results too!